Termination is used to match impedance with respect to impedance of the transmission line being used. When impedances are mismatched the transmitted signal is not completely absorbed by the load and the portion is reflected back into the transmission line. If the source, transmission line and load impedance are equal these reflections are eliminated. There are disadvantages of termination as well. Termination increases load on the drivers, increases installation complexity, changes biasing requirements and makes the system modification more difficult. The decision whether or not to use termination should be based on the cable length and the data rate used by the system. A good rule of thumb is if the propagation delay of the data line is much less than one bit width, termination is not needed. This rule makes the assumption that reflections will damp out in several trips up and down the data line. Since the receiving port will sample the data in the middle of the bit, it is important that the signal level be solid at that point. In most cases termination is not required. There are several methods of terminating data lines. Most commonly used is a parallel termination. A resistor is added in parallel with the receiver’s “A” and “B” lines in order to match the data line characteristic impedance specified by the cable manufacturer (120 ohms. is a common value). This value describes the intrinsic impedance of the transmission line and is not a function of the line length. A terminating resistor of less than 120 ohms should not be used. Termination resistors should be placed only at the extreme ends of the data line, and no more than two terminations should be placed in any system that does not use repeaters. This type of termination clearly adds heavy DC loading to a system. Another recommended type of termination is AC coupled termination. It adds a small capacitor in series with the termination resistor to eliminate the DC loading effect. The picture below illustrates both parallel and AC coupled termination on an RS-485 two-wire node. When an RS-485 network is in an idle state, all nodes are in listen (receive) mode. Under this condition there are no active drivers on the network. All drivers are tri-stated. Without anything driving the network, the state of the line is unknown. If the voltage level at the receiver’s A and B inputs is less than ±200mV the logic level at the output of the receivers will be the value of the last bit received. In order to maintain the proper idle voltage state, bias resistors must be applied to force the data lines to the idle condition. Bias resistors are nothing more than a pull-up resistor on the data B line (typically to 5 volts) and a pull-down resistor (to ground) on the data A line. 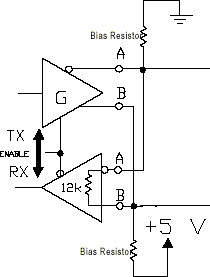 The picture below illustrates the placement of bias resistors on a transceiver. The value of the bias resistors is dependent on termination and number of nodes in the system. The goal is to generate enough DC bias current in the network to maintain a minimum of 200mV between the B and A data lines. Bias resistors can be placed anywhere in the network or can be split among multiple nodes. The parallel combination of all bias resistors in a system must be equal to or less than the calculated biasing requirements. This device uses 4.7Kohm bias resistors. That value is adequate for most systems without termination. The system designer should always calculate the biasing requirements of the network. Symptoms of under biasing range from decreased noise immunity to complete data failure. Over biasing has less effect on a system, the primary result is increased load on the drivers. Some systems can be sensitive to over biasing.